The holiday season is coming up quickly and it’s time to start preparing for the festivities. This time of year brings joy and excitement spent with family – including our pets! Below are some tips for you to keep your furry family members happy and healthy during this holiday season. Lights and decorations are common staples in many homes during the holiday season. Beautiful displays with lights and Christmas Trees are sights to be enjoyed by all! Your pets may be very curious by all of these new additions to your home – it is important that we make sure that they do not become too curious! Christmas Trees – Pets can be very interested in this new addition to your home. Dogs and cats may get close to the tree and try to investigate – they may even try to climb the tree! This can lead to the tree falling over and causing injury to your pet. Try to put up your tree in an area that can be off-limits to your pets unless you are there to supervise – perhaps in a room with door! Electric cords – Now that you have your tree up, you may decide to brighten it up with some stringed lights! Be sure to always supervise your pet when electric cords or lights are plugged in or have them covered and hidden. It is important to never let your pet chew on these cords as they can cause electrocution! Ribbons, tinsel, yarn – You may be using ribbons and tinsel to decorate your tree and wrap gifts! These can be dangerous to our pets if ingested as it can get caught up in the intestines and may need to be surgically removed. Glass ornaments – It is important to be careful when using ornaments made from glass material. If you pet were to get ahold of one of these ornaments and ingest some of it, the glass pieces can cause quite a lot of damage to their gastrointestinal system if swallowed. Potpourris – The wonderful smells of Christmas! Skin or oral exposure to liquid potpourris can result in severe oral, skin and eye damage. Please keep this out of reach from your pet and clean up any spills right away! The holiday season is often filled with wonderful home cooked feasts to be enjoyed by all! It can be very tempting to share some of our delicious treats with our pets – especially when they look up at us with those adorable eyes! As tempting as this may be, there are many foods that we should avoid sharing with our furry friends. Fatty foods – Offering foods that are too rich, fatty or spicy, or even a food that our pet is not familiar with, can lead to a bout of intestinal upset. In some cases, this can lead to serious inflammation of your pet’s gastrointestinal tract and pancreas. The pancreas is an organ that makes essential digestive enzymes and insulin. When this organ becomes inflamed, your pet may experience signs of vomiting, diarrhea, decreased appetite, weakness, abdominal pain, and dehydration. The inflammation of the pancreas can become severe and life threatening. It is important that your pet receive medical attention right away if they experience any of these signs. Be sure to avoid feeding any fatty foods such as fatty chicken or beef pieces, poultry skin, or gravy! String wrapped around meats – When removed, the string that is wrapped around turkeys and roasts can be very appealing to our pets. Many pets like to play with string, but this string also contains flavours from the meat. These can be dangerous to our pets if ingested as they can get caught up in the intestines and may need to be surgically removed. 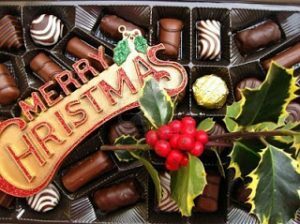 Chocolate – What a delicious holiday treat!! As delightful as chocolate may be for us, it is toxic to our pets! Chocolate contains two chemicals called theobromine and caffeine, which can be deadly to our cats and dogs. Be sure to keep all chocolate up high or put away where your pets cannot access it. Be sure not to leave any chocolate gifts wrapped under the tree for your pet to sniff out and unwrap! Moldy or spoiled foods – Moldy foods contain a toxic substance made by fungus – called mycotoxin. Mycotoxins are toxic to our pets and can lead to signs of muscle tremors, trouble walking and convulsions. Be sure that your pets do not have access to the area where you keep garbage or compost bins to avoid contact with mycotoxins. Onions & garlic – While onions and garlic are wonderful for adding flavor to holiday meals, be sure not to feed any to your pets. Pieces of both uncooked or cooked onion or garlic, even onion or garlic powder, can cause damage to your pet’s red blood cells and can lead to anemia! Rising bread dough – Who doesn’t love home made bread? It is important that we keep the raw bread dough away from our pets! The warm and wet environment of the stomach allows the yeast in the bread to grow and the bread will start to expand. This can lead to a serious case of bloat, which could become life threatening. Yeast can also release alcohol, which can lead to depression, weakness, and comas in our pets. Macadamia nuts – A nice tray of nuts is a great gift to give at Christmas! Remember not to leave them under the tree or in your animal’s reach. If ingested, macadamia nuts can cause vomiting, weakness, depression, difficulty walking, and tremoring. Holiday flower arrangements and flower decorations are a wonderful gift and way to spread the holiday spirit. It is important to know which holiday plants are toxic to our pets to avoid bringing them into your home or keeping them out of your pets reach. Here are some holiday plants that can cause toxicity in your dog or cat. Poinsettias – Poinsettias are so beautiful and a classic Christmas gift. However, if ingested by your furry friend, can be irritating to their mouth and stomach, leading to nausea and vomiting. Mistletoe – Ingestion of mistletoe can cause vomiting, nausea, diarrhea and lethargy. If large quantities are eaten, it has the potential to cause heart problems and death. Holly – Ingestion of small amounts of holly can cause vomiting, nausea, diarrhea and lethargy. If large quantities are consumed, holly ingestion can be fatal. 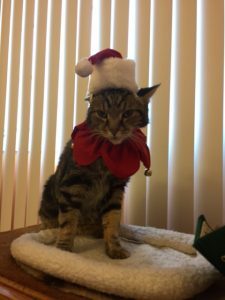 Lilies – Lilies may be found in holiday flower arrangements and can cause kidney failure and even death in your cat if consumed. Amaryllis – All parts of the Amaryllis plant are toxic. If ingested, the flower and leaves may cause vomiting, diarrhea, and drooling. The bulb is very toxic and can cause weakness, trouble walking, tremors, and seizures. If you suspect that your pet has been injured or has ingested something toxic during this holiday season, please contact your veterinarian immediately. If you have any questions or concerns regarding your pet during the holiday season, please feel free to contact the staff and veterinarians at the Avonlea and Hollybank Animal Hospitals! 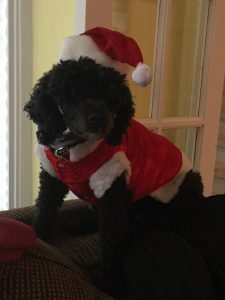 Happy Holidays to all of you and your furry friends! !